“Count the gills, count the gills!”: It’s the first live sighting of the creature off the Philippines, but the giant sharks were once common in Puget Sound. Paul Mayer was in the control room of the R.V. Petrel when the big shark swam into view on the ship’s video monitors. 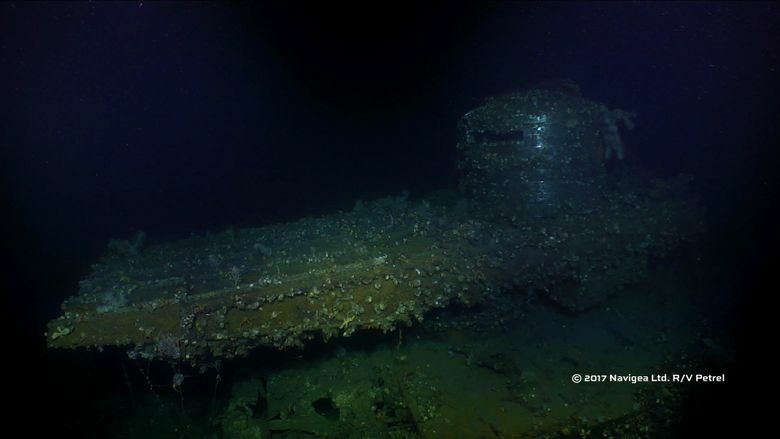 The crew of Microsoft co-founder Paul Allen’s research vessel was working round the clock, searching for sunken World War II ships off Leyte Island in the Philippines. But now all eyes were locked on the predator meandering languidly 850 feet below the surface. 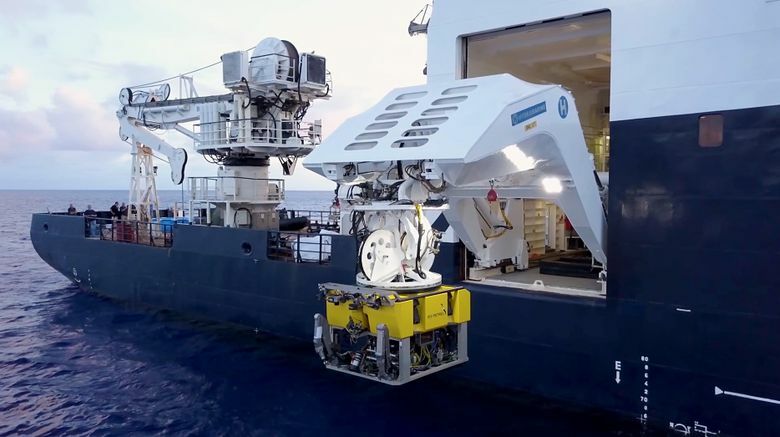 The crew maneuvered the ship’s underwater drone so its cameras could get a better view. The resulting video clearly shows the 12-foot female flaring her gills as she veers away. “Count the gills, count the gills,” one of the crew members urged. The video, shot on Dec. 2 and released this week by Allen’s Seattle-based company Vulcan, represents the first sighting of a live, bluntnose sixgill in the Philippines. It’s also an unusual cameo by a creature that humans rarely encounter anywhere — but which experienced a brief population boom in Puget Sound more than a decade ago. A rare bluntnose sixgill shark filmed by the team on Paul Allen’s research ship, the RV Petrel, as they search for sunken WWII ships off the Philippines this month. “I’ve been able to dive all around the world, with lots of sharks, and this is only the second one I’ve ever seen,” Mayer said after returning from the expedition Monday. Rivaling great white sharks in size, sixgills have huge teeth meant for slashing fish and marine mammals. “They are made for taking out big prey,” said Heithaus, who has developed a night-vision camera he hopes to attach to sixgills to spy on their hidden lives at depths where no light penetrates. He’s used similar techniques with other sharks and whales. “Getting a camera on these animals is the only way to directly observe their environment, to see how they interact with their prey and what they’re feeding on,” Heithaus said. Sixgills are probably distributed throughout many of the world’s oceans, ranging down to depths of 3,000 feet or more, he added. They occasionally venture into Puget Sound, but biologists were stunned in the early 2000s when divers started reporting frequent sightings in the shallow waters of Elliott Bay, said Joel Hollander, of the Seattle Aquarium. Hollander joined with state and federal scientists to study the mysterious sharks, some of which were congregating around the aquarium’s own pier. Between 2002 and 2005, the researchers counted 273 of the animals and tagged 45. Slow-moving sharks that can grow up to 15 feet long, sixgills are believed to be more primitive than other modern sharks, which have five sets of gills. The additional set of gills may help them survive in deep waters where oxygen levels are lower than at shallow depths. The International Union for Conservation of Nature and Natural Resources lists the sharks as “near-threatened.” In some places, they’re fished commercially and for sport, and scientists suspect some populations have been severely depleted. Most of Puget Sound’s sixgills appeared to have vanished by 2008, Hollander said. The animals were almost all young, and genetic tests showed many were related to each other. The scientists theorized that a few adults had been using Puget Sound as a nursery. When the offspring reached maturity, they probably migrated to the open ocean. With no more sixgills around, the study was disbanded. But local divers still spot an occasional one, and the Seattle Aquarium continues to track the observations. “Divers are so excited about seeing such a cool animal that we almost always hear about it,” Hollander said. 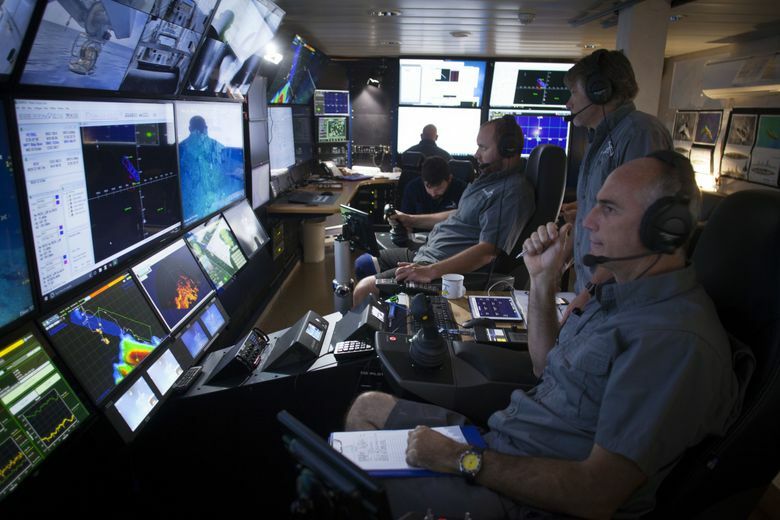 Allen’s shipboard crews also always keep their eyes open for sharks and other marine creatures, said Mayer, who sometimes pilots the manned submarine on the philanthropist’s 414-foot yacht Octopus. Marine science and conservation are among Allen’s eclectic philanthropic causes. 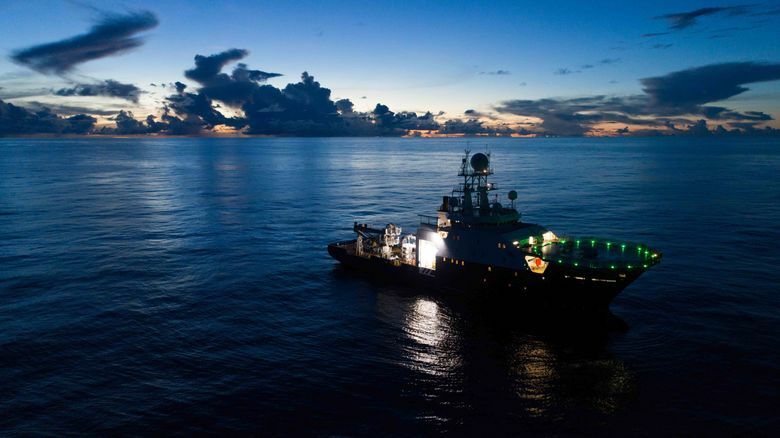 He recently funded University of Washington scientists to study the deep ocean and Antarctic ice shelves. His Global FinPrint initiative, launched in 2015, aims to provide the most accurate census ever of reef-dwelling sharks and rays, many of which are threatened with extinction. Heithaus is one of the project’s coordinators. World War II is another of Allen’s passions, and the R.V. 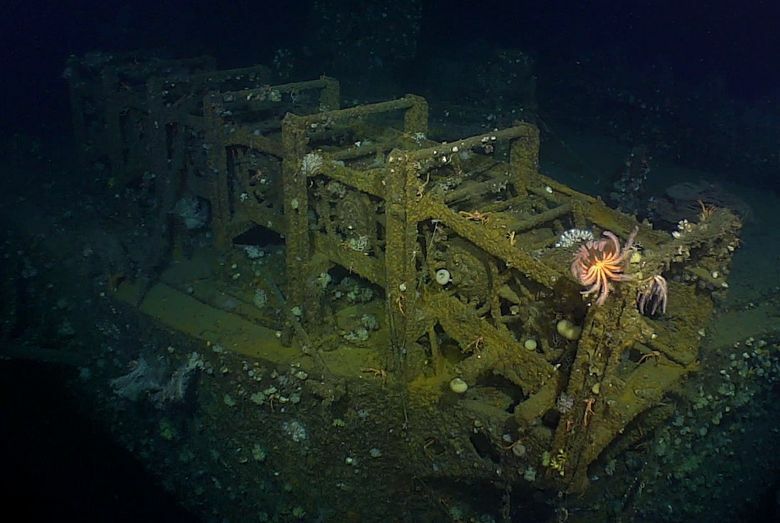 Petrel succeeded this month in its primary mission of locating the wreck of the USS Ward. 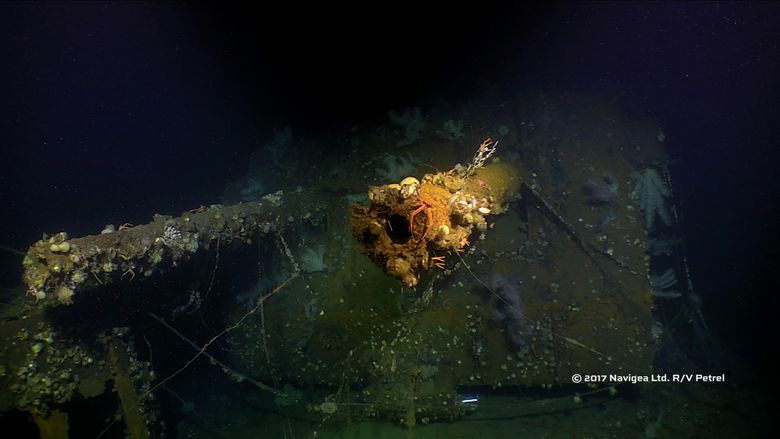 The destroyer fired the first U.S. shot of the war when it encountered a Japanese midget submarine acting as scout for the Pearl Harbor attack. 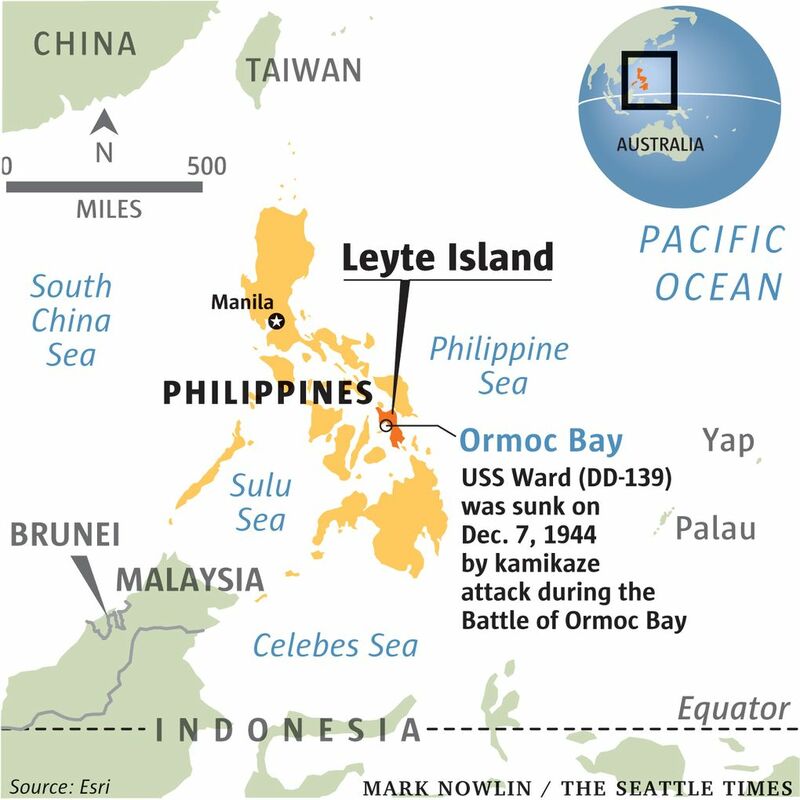 Ormoc Bay, where the crew filmed the sixgill, was the site of a protracted battle late in 1944 that sent more than 30 Japanese ships to the bottom, along with three U.S. destroyers — the USS Ward among them.